Stayed in room 22 in Costamar and this apartment has been completely refurbished. It has all you need, cooker, microwave, kettle, taster, washing machine, iron and board, hairdryer and dvd/cd player. There are great views over the harbour and the island of La Gomera. It is in a quiet location, away from road noise and bar noise. Just outside reception, in the same building, is an Iceland supermarket. Just across the road are several good restaurants and bars. The costamar is on the sea front just 20 minute walk from a sandy beach. No hills!! it is basic in some rooms. There are many private owned apartments which have been modernized. Our room did not have a Harbour view but we could see the hill. Beds not the most comfortable. If you go out to eat and only need a place to sleep and shower in,it is ideal. There is a Iceland nearby and a few bars and places that have entertaiment every night. Near the Sunday Market. You need to Try The Irish Times,which is above Dreamers. But better still go though the tunnel near the harbour to playa los vista beach to the CLADDAGH. It is above North and south bar opp the fountain. It is a lovely place,drinks are good measures and not exspensive. They do a Sunday session with Free home made Irish Stew which is fantastic. We stayed in apartment 34, unbelievable views from our room over the harbour and out to sea. Apartment had everything we needed, hairdryers, iron, fridge, micro, PlayStation, DVDs & games. The apartment is very well kept and looked after, i would highly recommend. we've booked to go again next year. Ideal for Sunday market, beach and town, bars and restaurants near by. The hotel may looked dated from the outside but believe me, this apartment is very clean and modern. 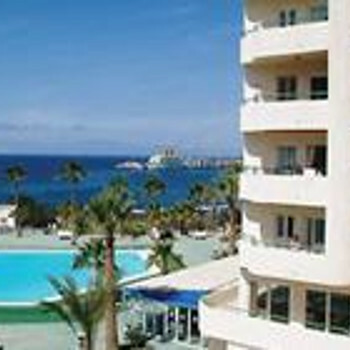 We stayed in a privately owned apartment situated on the 3rd floor of the Costamar Hotel, Los Cristianos. The hotel is on the sea front with fantastic views from the apartment, to the harbour, over the town and out to sea. There is a gate which leads directly onto the prom. and in the reception area there is internet excess (to check your e-mails). The hotel even has its own iceland supermarket, but a cheaper loacl supermarket is across the road. The apartment we stayed in was very clean, bright and well looked after, with 2 bedrooms a twin and double, a large walk in shower, full kitchen, tv, dvd, games console, and all the extras you might need, iron, microwave, hairdryer, the apartment even had 2 foldaway sunbeds which could be used by the pool, which saved us money as the hotel charges for the use of there beds. This was a privately owned apartment on the 12th. floor. It was small but well equipped, clean, smartly furnished and with views to die for over the mountains to one side and the sea with distant views to the other. The location was convenient for bars, shops etc. yet quiet due to its location. The grounds were basic but decent and we particularly appreciated the Internet access from the computer in Reception. We liked it so much we have already booked for next Spring.